A stunning Sixties look – candy colours and big hair – and seriously inspired performances make this welcome revival a most entertaining evening out. 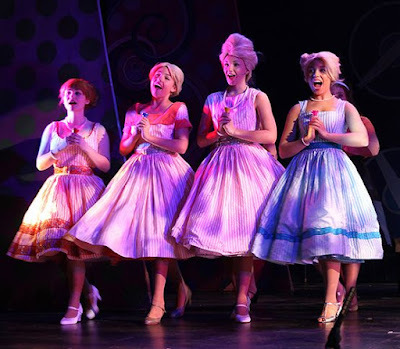 Jeremy Tustin's lively production does not overplay the social comment card - “negroes and chubby girls buy hairspray too” just about sums it up – but makes the most of the all-singing all-dancing numbers like the iconic You Can't Stop The Beat. Not quite colour-blind casting, though we did enjoy an effervescent Paul French as Seaweed, son of the larger-than-life Afrotastic Miss Maybelle [Carmel Adekunle, outstanding in her big numbers]. A traditional Edna from Samuel Wolstenholme, stepping into Michael Ball's court shoes as the plus-size laundress. A memorable turn – his duet with Jack Toland's Wilbur, which they seem to enjoy as much as we do, that's to say hugely, is worth the ticket price alone. Tracy Turnbull, the “pleasantly plump” teenager who takes on the prejudices of prime-time station WZZT, is given a wonderfully warm characterization by Amy Hollingsworth. There's not a weak performer anywhere on this crowded stage; the company ensemble is excellent, as are the Dynamites and the male backing group for It Takes Two, Tracy's duet with the tv heartthrob Link Larkin [Jack Martyn]. The choreography is inventively nifty – there's even a touch of tap. “Turn that racket down, I'm trying to iron in here !” yells Edna from the side of the stage. Hard not to sympathise, since the vocalists often fight a losing battle with Bryan Cass's excellent pit band. A real shame, since the lyrics carry the message behind the infectious pastiche of the music.